Posted by Tom Crimmins Realty on Friday, February 1st, 2019 at 2:57pm. THIS HOUSE FOR SALE CAN BE FOUND ON OUR WEBSITE TOMCRIMMINSREALTY.COM AS WELL AS NYC.FLEXMLS.COM (MULTIPLE LISTING SERVICE). 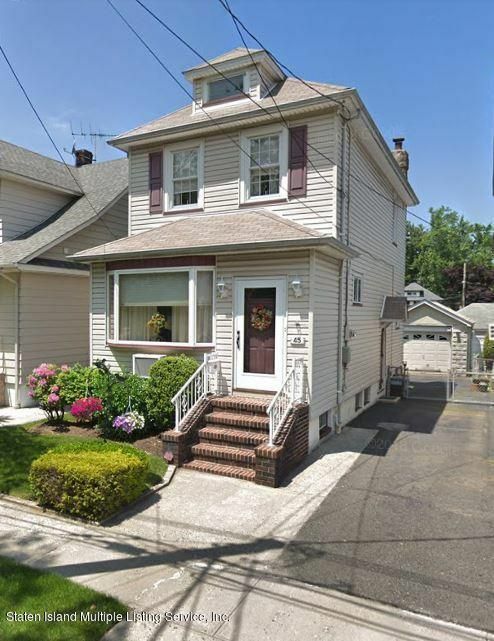 THIS CHARMING 3 BEDROOM HOME IS SITUATED ON A QUIET STREET IN WESTERLEIGH AND FEATURES AN OPEN LAYOUT WITH BEAUTIFUL HARDWOOD FLOORS THROUGHOUT (UNDER CARPETING) AND PERGO FLOOR IN THE KITCHEN. NEWER APPLIANCES INCLUDED, UPDATED BATHROOMS. NEW WINDOWS, ROOF AND VINYL SIDING. DETACHED GARAGE. BASEMENT IS PARTIALLY FINISHED PLUS LAUNDRY AND UTILITY ROOM WITH BONUS WORK AREA. HIGH AND DRY!